said they approved of Bush’s job performance. 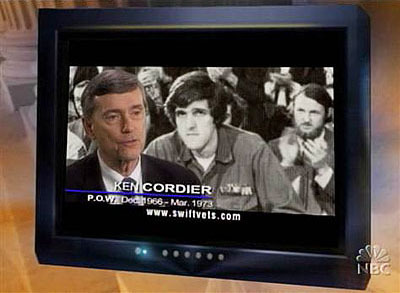 Kerry got an extraordinary 93 percent of the vote of Bush-disapprovers. The phenomenon of the anti-Bush voter who voted for him anyway out of disgust with Kerry’s flip-flopping was extremely rare. I don’t actually disagree with this much. Economic fundamentals matter a lot, and on that score it’s true that Kerry did better than expected. (Just as Democrats did worse then even the lousy fundamentals predicted in 2010.) But I don’t feel like writing about Muammar Qaddafi again, so I’m going to disagree anyway. So what happened in Ohio? Obviously economic fundamentals played the same role there that they played everywhere else. But there’s also this: Kerry lost Ohio by only 120,000 votes. This means that a switch of 60,000 Kerry voters to the Bush column was enough to give him a second term. And Ohio was, infamously, ground zero for saturation TV ads from the Swift Boat Veterans group about how Kerry was a conniving, lying, phony war hero who didn’t deserve his military decorations and, in fact, was something of a coward who connived to get his fake bronze stars so he could skedaddle out of Vietnam as soon as he could. The Swift Boat smears ran in heavy rotation in Ohio. Did that make a difference of 60,000 votes? Political scientists might say no: TV ads don’t have a huge effect, and they especially don’t have a huge effect months before an election, which is when the ads ran. But I’m not so sure. In a state like Ohio, these ads left a very sour taste in a lot of mouths. They not only took away Kerry’s aura as a decorated war hero, but actively tarred him as the worst kind of sniveling opportunist, a man who used fake wartime decorations to grease his way up the political pole. I don’t have a hard time believing that this might have switched 60,000 votes out of the 5 million cast in Ohio. So yes, fundamentals matter. But sometimes campaigns matter too. I think the 2004 presidential campaign is actually pretty good evidence for both.